Posterior Lateral Fusion (PLF) - Matthew D. Hepler, M.D. 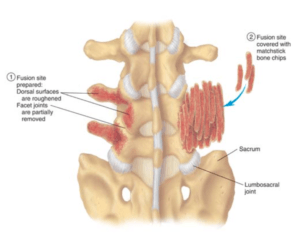 Spinal fusion is a surgical procedure that involves fusing, or welding, the motion segment between two vertebra together into one solid bony block. Russell Hibbs described the first successful spine fusion in 1911 and later applied his technique to scoliosis. The procedure has evolved considerably since that time and is now used to treat many spine related problems at any level of the spine. It is a “structural” solution that is quite effective treating structural problems (scoliosis, kyphosis, instability, spondylolisthesis) but is much more controversial in the treatment of non-structural back problems (discogenic back pain, chronic back pain). There are many techniques used to fuse vertebra together; ALIF, XLIF, P/TLIF and Posterior Lateral Fusion (PLF) are the most common. Who is a candidate for Posterior Lateral Fusion? Posterior lateral fusion is used to treat structural problems that require some form of stabilization. It’s commonly used in fractures, spondylolisthesis, or following extensive decompressions where removal of ligaments and facet joints may lead to instability; especially 1 or 2 level fusions or older patients. More challenging cases such as multilevel fusions or younger, high demand patients may require other techniques (interbody fusion such as ALIF, XLIF, P/TLIF) for better healing. Interbody fusions provide a large surface area of cancellous bone loaded under compression that is much more conducive to robust bony fusion (the posterior spine is under tension which is less conducive for bone healing). Spinal instrumentation is frequently included to provide rigid fixation and improve healing rates. What is involved in Posterior Lateral Fusion? The postero-lateral fusion involves getting the posterior surfaces of each vertebra to grow bone and “fuse together”. A posterior incision is made and the posterior surfaces exposed (lamina, spinous process, transverse process, and facet joints). The facet joint are resected and the bony surfaces are “decorticated” exposing bleeding bone to induce an inflammatory healing response. Bone graft, which contains bone forming cells, bone induction proteins, and conductive surface to promote bone growth, is harvested and placed in the facet joints and along the “decorticated” posterior elements. Spinal instrumentation is frequently added to provide rigid fixation to promote healing. Figure 1: Illustration demonstrating decorticated posterior elements (1) and harvested bone graft placed over the decorticated surface (2). What are the pros and cons of Posterior Lateral Fusion? All surgical procedures have inherent risks. These include but are not limited to infection, neurologic injury, failure to heal (non union or pseudo-arthrosis), and chronic pain. The most common risk is non-union although not all are problematic and require further treatment. Each patient is unique and only a comprehensive evaluation with a fellowship trained spine surgeon can give you the best appreciation of the risks and benefits for surgical treatment of your condition.